I am not entirely sure where this photograph came from, but probably from eBay in one of my purchasing sprees. There were no markings on the back. I really liked the composition of this photo. It conveys a sense of peaceful purposefulness with a touch of loneliness. 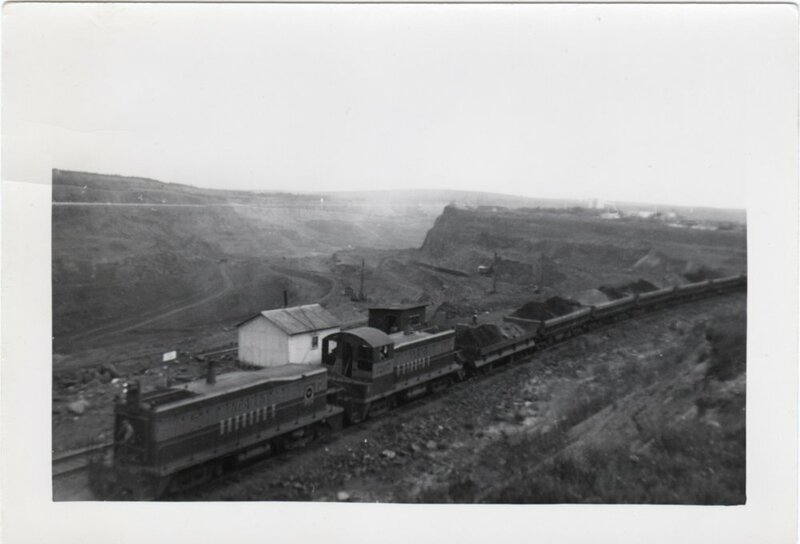 It appears to be a freight train hauling coal or some other rock or sediment, perhaps from a nearby quarry. There are some markings on the train if you zoom in. I read "O.E.M. CO" on the first car and "1200" on the second. Do you seen anything else? If you look closely you can see the image of at least two people. There appears to be a person in the second car directly above the "1207." There is also one person in the small dark shack adjacent to the larger white one. What are the stories of the men in the picture? How did trains, passenger or freight, play a role in your family's story? What do you think, wonder, or feel when you look at this photo? We are up to 16 pics o the week now. If you would like to see all of them in one place click the button below.